Like many, Brooklyn Supper is seeing some lean times. We’re cutting back on all meat and relying much more on the butcher and much less on the farmer’s market meat guy. We are also trying to make as many of the basic staples we eat from scratch. Things like broth and apple sauce. I made both this week with very satisfying results. 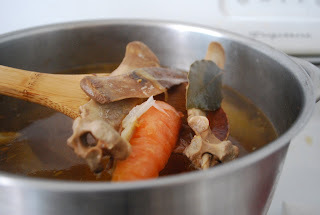 After making a large batch of pulled pork, we had a few pork bones leftover, and they were perfect for making broth. Rich and extremely flavorful, this broth owes much of the robust flavor to remnants of Brian’s pulled pork sauce. 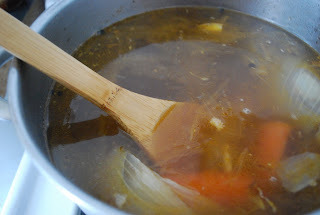 I am saving my broth batch for a time when I am more interested in braises and stews; this broth would also be great in a giblet gravy. Because I didn’t have the chance to make the broth right away, I covered and refrigerated the leftover bones. Also, I didn’t have any celery on hand when I made this, but if you do, certainly add 2-3 stalks. Behold yet another Brooklyn Supper broth recipe. In a large stockpot, saute the onions, carrots, and garlic in the olive oil. When they have softened, after five or so minutes, add the bones and fill the pot with cold water. Add the bay leaves, peppercorns and salt, and bring to a boil. Turn heat down so that broth is gently simmering for 5 hours, stirring occasionally. When you are satisfied that your broth has achieved its maximum potential, strain through a mesh strainer, being sure to push out any extra juice form the ingredients. Store in clean quart jars. Allow the jars to cool, and the lids to seal, then label and freeze. Be sure to fill the jars only to the freeze line, and, if there is any doubt, leave a good two inches on top. Your broth will keep for 6 months, especially if you push it to the very back of your freezer. I am going to try this today, I have some leftover pork bones from a pork roast. I thought it might make a nice base for a bean soup. This makes a really flavorful broth, and I think it will make fantastic bean soup. Let me know how it turns out! hi – I live in China and pork is the main meat around here. I am so excited to find this recipe! It’s better than using those MSG cubes! Do you need to use a pressure canner for this since there’s meat involved or would the same method to make jams shelf stable work? Hi Andrea, The broth in the recipe is meant to be frozen or eaten right away. We didn’t create this recipe to be canned, though I’m sure there are a lot of resources out there for properly canned meat-based stock. We just spit-roasted a small (40 lb) pig for an Autumnal Equinox party for 35 people. The meat from a young pig like this simply pulls off the bones, leaving a large amount of bone. I’m happy to find this simple recipe for pork broth; I expect to get a couple gallons. Will it be a suitable substitute for chicken broth in my roasted tomato soup? …I meant to add, I have almost ten lbs of skin, bones and head. Hi Ron, Sounds like an amazing feast! Brian and I are more than a little jealous. Here’s what we think: add the bones and skin for sure. We just don’t have any experience with pig heads (aside from eating) so I am not sure how the head boils up. If you do add the skin, I would spend a good deal of time skimming all the gray bits and foam that float to the top. Otherwise, you should be good to go. As for your soup, I think it will be fantastic! If your broth is particularly gelatinous, and I’m guessing it will be, you may want to add a little less broth than usual since it could be a lot more flavorful than the average chicken stock. Good luck!